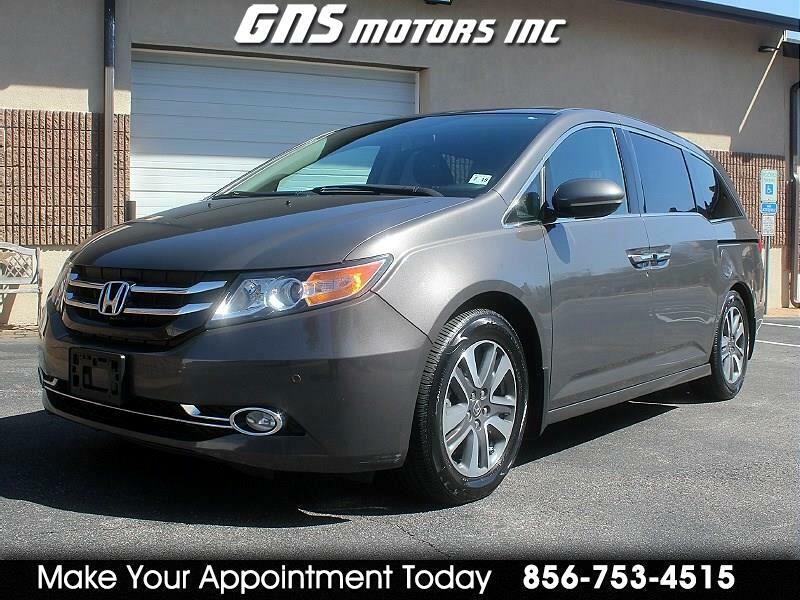 Used 2014 Honda Odyssey 5dr Touring for Sale in West Berlin NJ 08091 GNS Motors Inc.
2014 HONDA ODYSSEY TOURING EDITION * SUNROOF * NAVIGATION * 1 OWNER * DEALER SERVICED!! THIS ONE OWNER DEALER SERVICED 2014 HONDA ODYESSEY TOURING EDITION IS IN EXCELLENT CONDITION!!!! CHECK IT OUT ON YOU TUBE https://youtu.be/9-xlzgBnHiA * IT HAS ALL POWER * NAVIGATION * BACK UP CAMERA * FRONT COLLISION WARNING * SUNROOF * BLUETOOTH DVD PL AYER * AM/FM/SAT /CD STEREO * USB/AUX * DUAL CLIMATE CONTROL * REAR CLIMATE CONTROL * HEATED LEATHER MEMORY SEATS * CRUISE CONTROL * HEATED SIDE MIRRORS * PUSH START * KEYLESS ENTRY * XENON HEAD LIGHTS * FOG LIGHTS * TILT AND TELESCOPIC WHEEL * STEERING WHEEL CONTROLS *18" ALLOY WHEELS WITH NEWER TIRES * TRACTION CONTROL * FRONT AND REAR PARKING SENSORS * LANE DEPARTURE WARINING * KEYLESS ENTRY ALARM * POWER LIFT GATE * DUAL POWER SLIDING DOORS * HITCH ALREADY INSTALLED FOR YOUR BIKE OR CARGO RACK 84,361 HIGHWAY MILES!! MUST SEE!! 25 YEARS IN BUSINESS WE PRIDE OURSELVES ON NO HIDDEN FEE'S AND A NO PRESSURE ENVIRONMENT!! WE OFFER AS LOW AS 3.99% FINANCING!! .. ALL CARS COME WITH A FREE CARFAX .. WARRANTIES ARE AVAILABLE ON MOST VEHICLES .. PLEASE CALL 856-753-4515 .. TO MAKE AN APPOINTMENT TO COME SEE AND DRIVE .. OUR VEHICLES ARE KEPT IN OUR INDOOR SHOWROOM SO AN APPOINTMENT IS NECESSARY .. FOR MORE PICTURES AND TO VIEW OUR INVENTORY ONLINE GO TO... WWW.GNSMOTORS.COM ..